Snack Girl gets asked all the time for low carb snacks and high protein snacks. Here is my latest list of snacks that will satisfy my readers’ requirements. Keep in mind, if you just eat protein and skip other important food groups you probably won’t feel so good (or be very regular). What qualifies as a high protein snack? I decided that the best measure was whether the grams of protein per serving was more than the grams of carbohydrate per serving. There are some great snacks that include beans that are both high in protein and carbs, but I skipped those for this list. The snacks below feature either dairy, meat, or eggs to get their high protein rating - but they also include vegetables or fruit to balance them. Give these ten snacks a try! 5. Who Else Wants Bacon? Please share your high protein snack ideas. 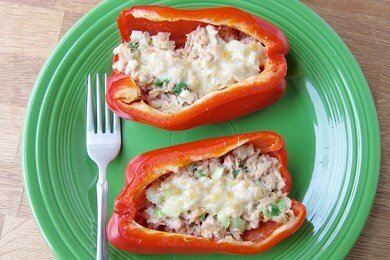 Love the tuna in the pepper! What a great idea!!! Inspired by the tuna in a pepper, I mix a hard boiled egg with low fat cottage cheese for a mayo-less egg salad. Into the pepper it goes! Very satisfying. Hubby just came back from Costco with a big bag of delicious red peppers. Sweet idea for 'em!